Whether you want to think of it as DLC or as a standalone game, Torna, the Golden Country captures some of the best parts of Xenoblade Chronicles 2 in a small, but still content packed form. Its prequel story to Xenoblade Chronicles 2 serves well as both as something that gives more insight into the world and history of it, but also as its own complete story, featuring its own new characters alongside ones that had development that helps me properly understand them as characters. Beyond that, Torna, the Golden Country also boasts the great quests and blade development systems that made the original game so addictive and the way some of these quests tie into the story and character development made doing them feel very rewarding and the world richer for it. As an expansion on an already great world, Torna, the Golden Country feels like more than just DLC with its 20 hour story campaign and with plenty left to do after, it’s a perfect addition to enrich Xenoblade Chronicles 2’s world while standing more than well enough on its own. Torna, the Golden Country is set 500 years in the past of Xenoblade Chronicles 2’s story in the same world of Alrest, but one that is different enough thanks to the time difference. Instead of following the story of Rex and Pyra, we’re greeted with new protagonists in the form of Lora, a driver and mercenary, and her blade Jin, who many may recognise from Xenoblade Chronicles 2. Despite having many characters we know from Xenoblade Chronicles 2 such as Mythra, Torna, the Golden Country elaborates on the story of the Aegis War, an event mentioned in Xenoblade Chronicles 2 that involves protecting Torna from Malos, an antagonist from the original game, but this time explored much more deeply to show the effects this event had on the characters and world in both the DLC and the main game. The story DLC is about 20 hours long and tells its story well through a mix of main story events like in Xenoblade Chronicles 2 and also its side quests. 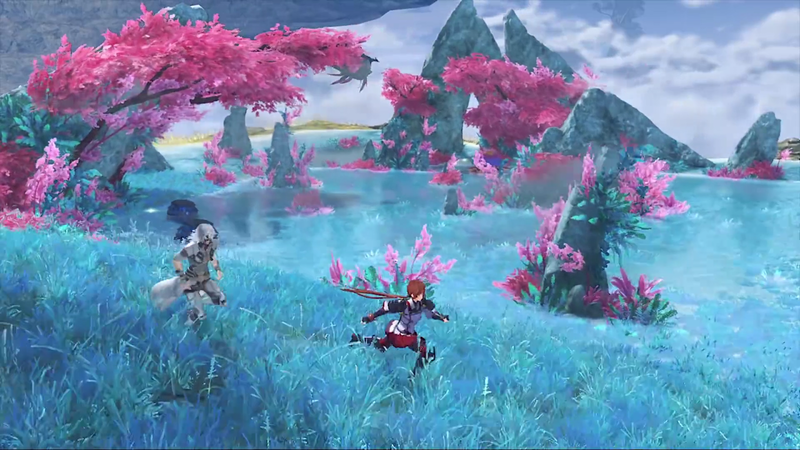 The first portion of the story plays out much like in the original game by using main quests, with the story itself adding a bunch of history and lore to the Xenoblade Chronicles 2 world while also giving insight into characters we don’t know so well such as Lora and Addam, along with a deeper look into the other characters that play a darker or different kind of characters in Xenoblade Chronicles 2. The second part of Torna’s story plays out a little differently by requiring the use of side quests to continue, which tell the story in a different way through smaller bits of character development in each quest developing the main cast, and also the world and people living in Torna. The mix of bigger plot development coupled with the smaller quest based ones mixed in in the second is something I’d usually think would slow down pacing and the momentum, but instead helped to create a connection to the characters and world of Torna that made the ending of its campaign much more impactful and although its story flow was different to what I was prepared for, it really gave that feeling of connection by the end of it. 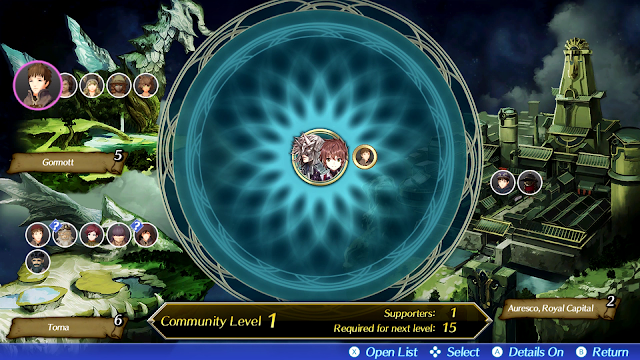 Aside from the main story quests, the smaller quests in Torna, the Golden Country all link to the new Community system, a system that gives you a rank based on how many people you help through quests in its city. The ranking is mostly for fun, although unlike the optional nature of quests in Xenoblade Chronicles 2, you’ll need to rank up a few times for some main story quests to be able to continue. I found this interesting as it strays a little from the feeling of freedom in the original game, but as I said, these end up giving an amount of character development that helps the story be more impactful, so I can understand why the quests are like this, but I’m sure at first glance this might be hit or miss for people who like to save quests until the end. I usually prefer my quests to be optional, but I think this DLC managed to have a balance of decent amount that let me get to know its characters well and stopped short of making me sick of doing them and thanks to the amusing character development featured in the story, it still had the Xenoblade Chronicles 2 effect of making me want to go back and play with more of them after completing its main story. As for the story content itself, I was impressed with how this DLC flipped my perspective on certain characters such as Mythra and Jin who I didn’t really care that much for in Xenoblade Chronicles 2, but was able to understand and genuinely like much more through the quests and scenes of Torna, the Golden Country. I also like how the story explored this important chapter of Xenoblade Chronicles 2’s history in much more detail; it shows enough to give insight needed into this Aegis War that makes certain things in Xenoblade Chronicles 2 make much more sense, but since it’s so far back in Alrest’s past, it seems like it could also be accessible to the newcomers to the Xenoblade Chronicles 2 world who may want to try Torna, the Golden Country to see if the style of story-telling and gameplay. Since I haven’t played the full story of Xenoblade Chronicles 2 in a while I’m not sure if it’s totally spoiler-free, but if you don’t mind hearing about story lore before you play the full game, Torna, the Golden Country is fine to play by itself in my opinion and for those who have already played Xenoblade Chronicles 2, it only enriches the world more. Many of the core mechanics of Xenoblade Chronicles 2 are present and at their best in Torna, the Golden Country on top of some interesting new ones. There are new Blade Affinity Charts that have me tempted to complete them, there are many quests to find both in and out of the story, secret areas hidden on its map waiting to be found and an updated version of its crafting mechanics. The new camping and updated crafting mechanics I found particularly fun since I like finding recipes in JRPGs. Crafting is done at camps where you can also chat to get even more insight into the personalities of your party members somewhat like Heart-to-Hearts from the original game, along with leveling up like you would do at inns. The crafting mechanic resembles the cooking one, but with more item creation options - some characters can cook, but other characters like Lora can make charms among the other crafts shown in its cute icons, with all of the crafting methods matching each characters personality. These serve mostly as Pouch items for characters, but there were also a few items that would unlock new collection points as well, so if you get caught up in the item collection and completionist aspects of Xenoblade Chronicles 2 like I do, you may find yourself spending a lot of time finding these recipes. A lot of these recipes are found in community events that tie the new mechanics together well, with fun moments like doing a quest involving collecting fish and then having one of the characters come up with a fish-related recipe being a nice little touch to enjoy while exploring the new and updated places in its world. Along with adding new mechanics and areas, Torna, the Golden Country also takes the time to update and refine its core ones. If you enjoyed Xenoblade Chronicles 2’s combat system, the streamlined version of Blade Combos and being able to control blades up front act as small but good additions to clean up combat and make it more enjoyable. Rather than the UI showing your combo options in the top right corner, it instead lets you figure out your options by using the attack names when choosing elements, which makes things a little easier to keep track of everything all at once. On top of that, being able to switch from Blade to Driver Swiftly adds a welcome new piece strategy into the mix considering the auto-attacking nature of the combat system in general. Being able to switch who’s on the frontline meant keeping an eye on HP more to get the most out of each character while keeping everyone alive, along with making finding the right element for elemental attacks more involved. 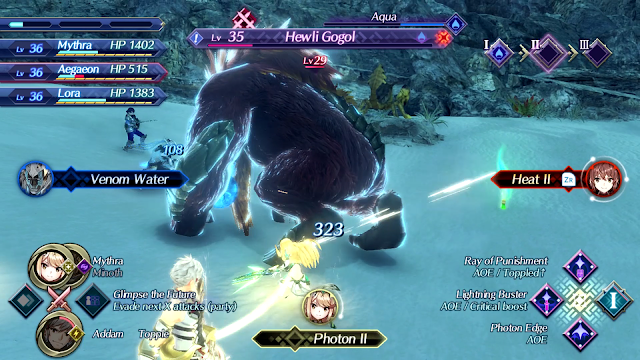 With these small but impactful changes, the combat is easy to pick up if you’ve already played Xenoblade Chronicles 2 and with quick tutorials that get you into the fully developed combat system much quicker than the original game, it’s also more accessible in general in this entry. Since it has a mix of its original mechanics and new ones, Torna, the Golden Country’s playtime features the same insane amount of replayability that Xenoblade Chronicles 2 does and I’m sure I’ll be playing it will beyond its original 20 hours since I want to get to know its enjoyable group of characters as much as possible. There are at least over 50 side quests to do for the Community mechanic and while you do a majority of these as part of the main story, I still haven’t found everyone I can make join my Community circle. 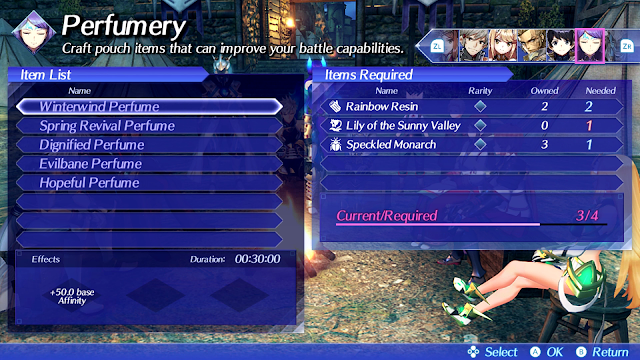 On top of all these quests, I’m sure I have more unique monsters and secret areas to find, charts to complete and recipes to collect, with these making me think Torna, the Golden Country really captured the essence of its full source material as I have the same feeling of wanting to go back and do everything. 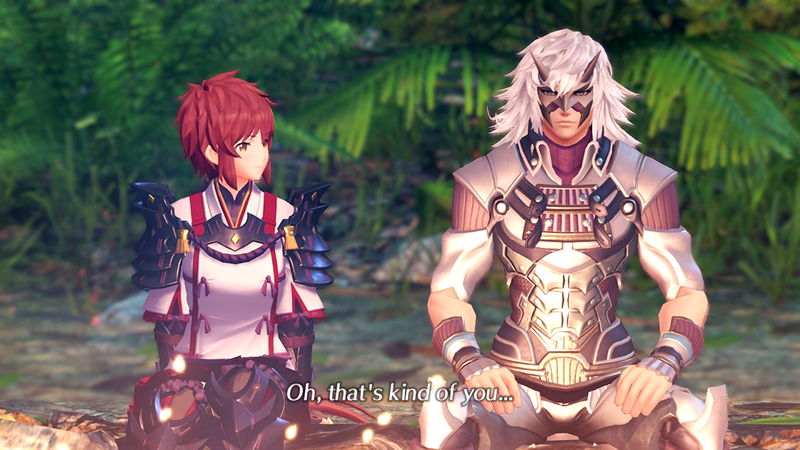 And with beautiful visuals in its cutscenes, great music old and new and an activity-filled world to explore, as DLC Torna, the Golden Country is about as generous and high quality as it gets and I think will be satisfying to fans old and new in this content rich experience. For those like me who enjoyed Xenoblade Chronicles 2 for both its story and extra activities, Torna, the Golden Country is a real treat. It did a great job in telling this story that shaped Xenoblade Chronicles 2 through its scenes and quests that made the experience one I felt emotionally invested in by the end thanks to the character development they feature. And I’m pleased to say I’m just as addicted to Torna, the Golden Country as I was to the original Xenoblade Chronicles 2 game. I’ve ordered a physical copy of the DLC in Japanese so I can use language study as an excuse to play more and I’m so ready to dive into the deeper, time consuming parts of blade development, finding crafting recipes and getting to know its characters even more now that they’ve grown on me in this experience. In short, Torna, the Golden Country is a great example of how good content rich DLC expansions can be and I’m sure I’ll be playing in its fun world of things to do and characters to get to know again very, very soon. Now let's try get this hour count the same as my Xenoblade Chronicles 2 one. You can pick up Torna, the Golden Country as a standalone* on Amazon! Did you pick up Torna, the Golden Country? If you did, what did you think of it? I absolutely agree, it is great DLC for Xenoblade 2. The story, even if you have played Xenoblade 2 will keep you absolutely engaged (I must say that everything this company does is beautiful, they are just masters of the RPG) and the mechanics are just refreshing the blade formula letting you use them directly to fight. The only bad points, if you ask me, would be the amount of extra quests that you need to do in order to get to the end of the game and also that we were unable to visit Uraya to see how the Aegis is awakened (perhaps it makes since the story is focused mainly in Lora, but still would have been awesome). There are a lot of quests to get to the ending, yes and I had a feeling not everyone would be into that kind of thing although I do like how they heightened the ending, but I understand when you have to do a quest it can feel a little annoying.